Fancy Wheat Field Bakery, carbo loading for the holidays! Dec 6 Fancy Wheat Field Bakery, carbo loading for the holidays! I've been to China a few times and as we all know, I have a penchant for baked goods of the mostly sweet variety. During visits there it became a challenge to find something, anything to satisfy my craving for some kind of thing with heft and frosting to quiet the sweet tooth. I think I've said this before but, for those locals who think Chinatown is just some unwieldy tourist trap to avoid when you don't have visitors in town, I disagree. I think it is actually a lot like a some neighborhoods in China. With is array of mom and pop shops, markets, restaurants and what not, it does give off the same vibe as if you were there. There might be a few more trinket stores around but otherwise, it is as close as you can probably get without actually having gone there. I mention this as I was out and about on these unseasonably warm days recently and found myself in Chinatown. Now I wasn't really looking for something sweet per se, but I'm not one to pass up an opportunity to try something. 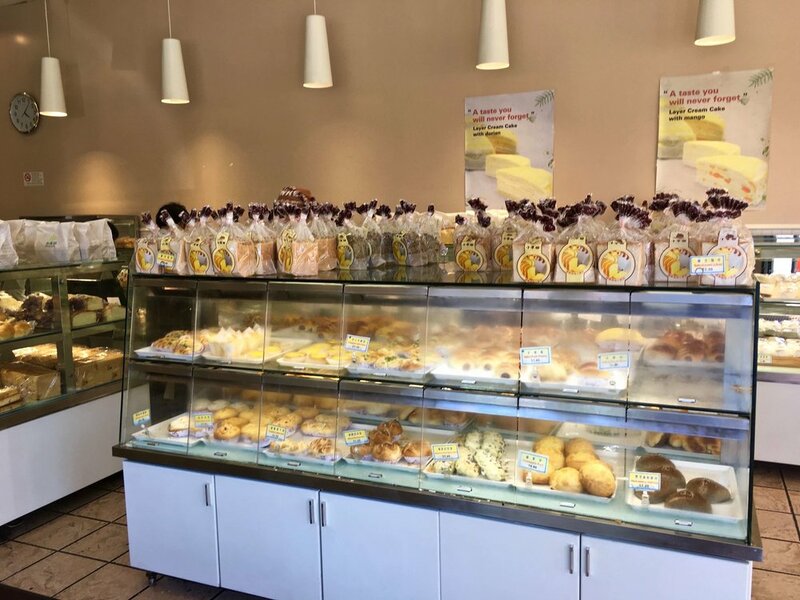 It is kind of how I found myself standing inside Fancy Wheat Field Bakery at Stockton and Vallejo. It isn't the only bakery in Chinatown, but it is larger and a tad more organized than some of the others. I'm guessing because it seems to be one of three that are around town. It also reminds a lot of some of the bakeries we hit in China as it is a mostly serve yourself place. You grab a tray and then wander around the plastic bins and use tongs to select the items you want. Some are wrapped and some are not and most of the items are gonna be less than $2. A relative bargain in SF, though it is all bread centric of the sweet and savory variety so if you are a carb watcher, this isn't for you. I made a couple visits to this location and each time the place seemed to be a bustle of activity (and I had to wait a bit for folks to clear out to get the pic above) with a steady stream of young and old coming and going. They bake most things on site and do manage to restock bins as they empty throughout the day. A good thing as I wanted to try as wide a variety of stuff as possible that looked tasty to my eyes at least. And that of course is something I've always found to be a problem with Chinese baked sweets. They seem to look sweet and tasty but then you get it and not so much. Same goes for some of the Chinese bakeries here in town. But since I wanted to try the savory here as much as the sweet, I got a mix and match of stuff on each visit. What better way to kick things off than with a classic you can find in dim sum shops and bakeries alike, the pork bun. This was the baked variety and though it had pork the whole thing was on the sweet side. From the bun to the sauce used with the pork, seemed to be copious amounts of sugar going on here. In the scheme of baked pork buns it is passable but I've had better and wouldn't really think of this as a place to try one. Hot dogs and pizza, how could I pass that up! A bun with chopped up hot dog, green onion and cheese and another bun with red and green peppers, cheese, onion and bits of sausage which seemed more like ham. The bread on both of these is similar and seems to be what is used for most all items savory and sweet here. A puffy, yeasty dough that rises up and has a tint of yellow throughout and borders on being just a bit undercooked as the bread seems to press together easily and stickily. This version was low on sugar content as opposed to the bun. Honestly, as quick cheap snack, I kind of liked them. They could have used a bit more cheese for my liking but overall, for the price, they were worth it. I also toasted them a bit and when heated, they were even better. Normally I steer clear of red bean things, not a fan. But I got this one as the SO likes them and this tastes exactly like it looks and you think it does--red beans and dough with a hint of sweet. They liked it enough, but me, I'm never really gonna understand the fascination with red beans and their paste in desserts, regardless of their supposed health benefits. The other was listed as a golden raisin custard roll, but when I opened it up I think I found one raisin and no custard. Maybe it cooked out? Like the bean thing it was slightly sweet, but that was from the bread. Otherwise, I was just confused by the whole thing. Moving on to things actually meant to be sweet, I saw these little individually packaged things and was drawn to the idea of milk cake and honeycomb cake. The milk one is a super light fluffy and airy dough which was pretty much angel food cake. The milk name comes from the color. It was like a puff of spongy air without much flavor. For the honeycomb cake I think I got it in my mind it would have honey in it because inside the package it seemed a little wet and sticky. Turns out the name has more to do with the little holes that appear throughout the cake. As opposed to the milk cake it was more of a stiff and hard sponge texture wise but it matched it for lack of flavor. That red bean thing tasted sweeter than these. I thought, hey, why not actually add some honey to it to kick it up a bit. Didn't really help. Neither did butter or heating them up by the way. I'm all about pineapple in desserts and thus my attraction to something called a pineapple bun. Apparently they must have meant "essence" of pineapple because if there was any in here, I missed. The bun was really just kind of a dry, crumbly sweet bread. But hey, it was less than a buck so no big loss right? I'll just pass next time. Here's something else I got for the SO since they are coco for coconut as it were. 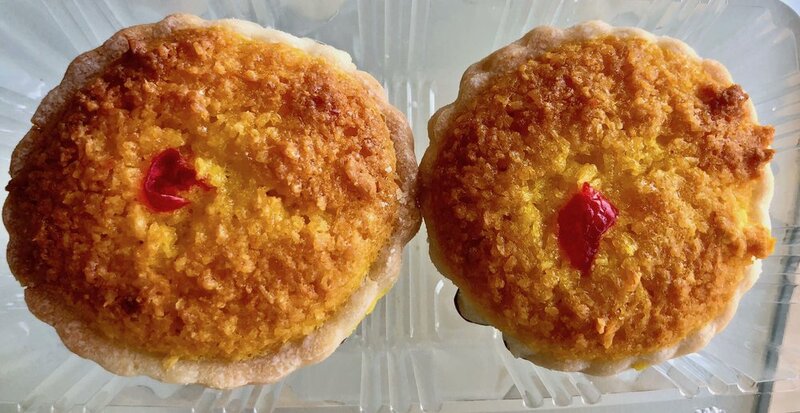 I figured they'd be kind of like mini coconut pies or something but the filling is more like a hard paste of coconut in a mini pie crust as opposed to a custard. They also come off as super dry. Even the SO wasn't much of a fan. How many of you know what durian is? Well, it is a spiky on the outside and fleshy on the inside fruit which is super popular in Southeast Asian countries. It also tastes sweet and smells like dirty socks. I'm not kidding, it really does. I've known about it, though it has been some time since I'd actually had some. I was intrigued with the idea of making a cream cake out of it. Or more precisely, alternating layers of sweet crepe and whipped cream mixed with durian. I was thinking when I got it that since it was mixed into something that perhaps the smell was altered or reduced somehow. Silly me. When I opened the container the slice was in, the waft of smell hits you full force and if you are not used to it, it can be intense and borders somewhere between sweet rot and dirty laundry. Sense of smell can play a big part in the taste of something and if ever there was anything you might need to try while pinching your nostrils closed, durian is it. I do know some folks who really like it--hello Ms. O! I was game to try it in cake like form, though the smell was tough to get past as was the fleshy, stringiness of the fruit bits itself. While I know this is kind of a delicacy of sorts, in the end, I just couldn't get through it or past it. So much for my cultural awareness, but at least I gave it a try! Though I will give it props for having both heft and sweetness, something lacking in many Chinese bakery "sweets." In the end, I think Fancy Wheat Field Bakery was pretty much what I expected. Lots of pretty looking things but a bit short on sweet and flavor, durian cake notwithstanding. Though those two savory buns were kind of tasty, affordable and something I would drop back in for if I was wandering around the hood. And, of course, if you wanna go all in and try something different then sure, get the durian cake, but I would recommend finishing it there (if you can) cause if you take it back home, it's gonna stink up your fridge. Seriously, trust me on this, I'm still airing out the apartment. Dec 3 weekly food news nosh and notes....hello holidays! !